I could have waited until Thursday to do this post, but I love being a rule bender. The Heartfelt Love Notes Paper Pumpkin had more materials in it than I knew what to do with. 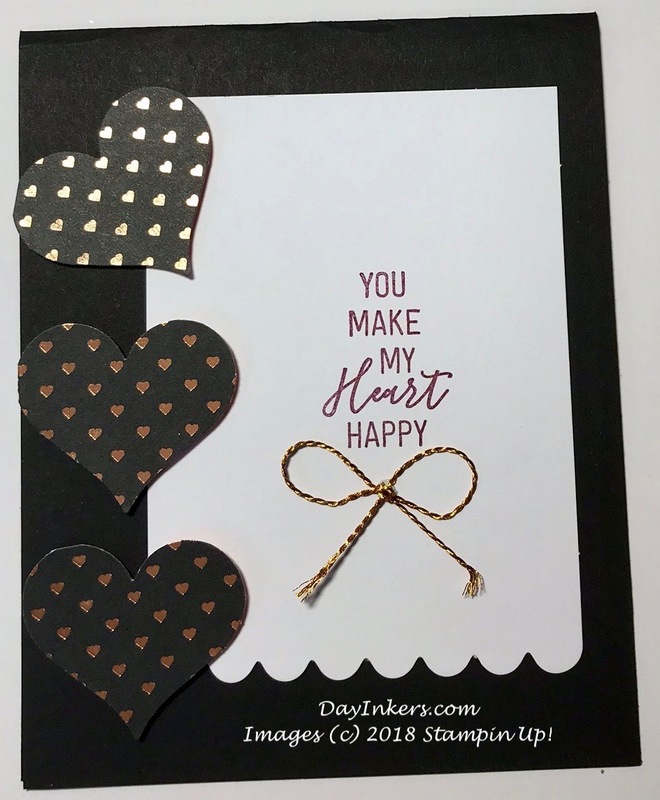 The design was so great – perfect for gift cards and such, but since I don’t give a lot of Valentine’s Day cards, I didn’t jump on completing this box. It’s been staring at me in my craft room. Making me feel guilty for neglecting it. Insisting that it was as good as the other boxes or better. Guilt had me scouring Pinterest looking for any ideas I could find. Here is the board where I collected all of the amazing ideas. I took those ideas and came up with a couple of cute ideas. Here is the first super simple one. I used a retired heart punch to create the hearts from some of the scraps I had from previous alternates I made. You could also use either the Wood Crate Framelits heart or the Puzzle Pieces Thinlits would be super cute with this design. This card is finished with a Happy Valentine’s Day message inside, but it could easily be a thank you card too. Easy, stylish and versatile – kind of like Paper Pumpkin. Next, I did a bit more fussing using the Balloon Bouquet punch and the Balloon Celebration stamp set. I used the returning Poppy Parade ink to create the stunning red balloons. A scrap of copper provided some shine along with some stickers left over from a retired kit. The cake and the twine are from the Broadway Star Paper Pumpkin. I think it makes a great birthday card. Hope you aren’t neglecting your Paper Pumpkin boxes. And if you haven’t subscribed and feel like you might be missing out, click here.